In today’s video blog post, we are talking about the Marist Lay-Up basketball shooting drill, a very useful drill for developing both hands, which is a very important component of a good basketball offense. Sometimes your players will think that skill development, particularly the same drills over and over, is punishment. But what you’ve got to do is create an environment where they feel like you’re building their skills, you’re building their game. Footwork is of critical importance and the foundation to everything you do with your offense. It’s important that you take your offense and develop the kinds of shots, the kinds of footwork that your players will feel comfortable with, whether it’s coming off screens or using a weak hand on a reverse around the basket. This is what we call Marist lay-ups. It’s really important that on a daily basis you are working on both hands. 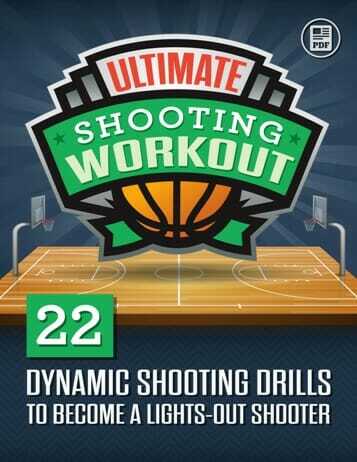 In this basketball shooting drill, we start from the first marker, then go to a second. Your players will have a lot of fun with the third marker. They’ll have to really try hard to stretch to make this one. And we work on these techniques because these are the kind of things that happen in a game situation – especially a transition situation. Begin with the foot on the first marker, and the inside foot should be back. Take one step with that inside foot (that is back) and lay the ball in. Begin with the foot on the second marker, with the inside foot back. Take on BIG step with that step with that inside foot (that is back) and lay the ball in. Begin with the foot on the third marker, with the inside foot back. Take a very BIG step with that step with that inside foot (that is back) and lay the ball in. Your players will have to stretch to make this shot! Start at the elbow, with the inside foot back, and now your players will try to dunk the ball by taking ONLY one step with the inside foot and then dunking the ball. This is a little bit tougher! Your players will have to work on really stretching it out to make the shot. Most of your players can do this relatively easy up to the third marker. Now we take this drill to the left side so we can work on developing the off hand. So with the same concept in mind, the left foot is on the first marker, right foot is back, and the player will step to the basket and lay it in. One thing in terms of lay-ups – I like the hand on top of the basketball. You can get greater distance to the rim and a little bit more control if you have that hand on top of the basketball as opposed to under the ball. You also get greater elevation. You can see how this could be very useful for developing both hands, which is something that’s very important. All of our fundamentals, offensively, we want to encourage the development of both feet and both hands. 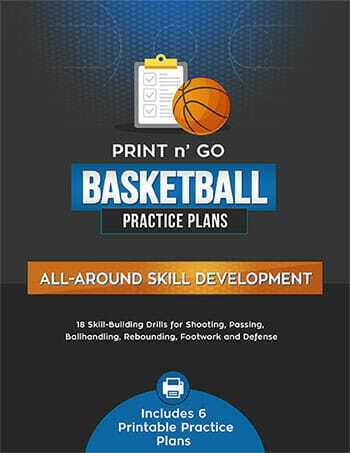 Looking for more great basketball shooting drills? 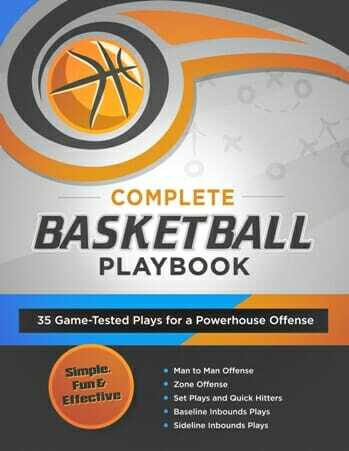 Then be sure to chec k out my drills and practice plans video series, with complete breakdowns of many basketball shooting drill sets. And don’t forget to “Like” Us on Facebook!